At the beginning of a post I wrote some time ago, I explained that it was written to feed a troll. I can't help feeling that if that one was feeding trolls, then this one will be kind of like spreading chum for them. Oh well. Before I start, though, I should note that Ed Yong has scooped some fascinating news involving whalefish. That has nothing to do with this post, but it is cool. 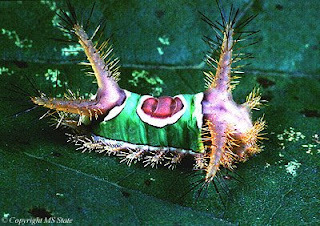 Saddleback caterpillar. Photo by Ross Hutchins. One topic that both of my regular readers may have noticed I don't cover here that much is the creationist/intelligent design movement and supposed anti-evolution "arguments" (use of quotation marks entirely deliberate). One reason is that I have the good fortune to live in a country where the creationist movement is not currently (tap lignin) a serious issue. But the main reason is that these days, I find the whole thing to be so incredibly dull. Dull, dull, dull. The supposed arguments trotted out at every opportunity are just so hackneyed and unimaginative. The evolution of whales? The divide between man and monkey? Puh-lease! Since when have these trivialities ever been really worthwhile mysteries? I could probably give you four better enigmas before I even had time to pull my socks on. If you're going to insist on positing a God of the Gaps argument, then at least extend the poor block the consideration of giving him a decent-sized gap to run around in*. *For some reason, as I wrote that I got the image of the aforementioned "gap" as something like a sort of cosmic rabbit hutch, with a bunch of onlookers exclaiming, "Oh look, a preternatural omnipotent deity! Isn't he just the cutest?" So what are some of these great mysteries? Well, the origins of the nucleus, endoplasmic reticulum and Golgi apparatus in eukaryotes would have to be one. The development of the macronucleus and micronucleus in ciliates is probably another. But for my money, the biggest head-scratcher in evolutionary biology would have to be the origin of the holometabolous insect larva. Nymph of the sandgroper (Cylindrachaeta), a hemimetabolous insect. Sandgropers are a type of burrowing Orthoptera. Photo from here. Insect development can be characterised as ametabolous, hemimetabolous or holometabolous. Ametabolous development is the simplest. Among modern insects it is only found in a few basal wingless orders such as silverfish and bristletails, though one very early fossil group of winged insects, the Palaeodictyopteroidea (which I must describe in detail some day, because they're simply fantastic), seems to have had an ametabolous or near-ametabolous development. Ametabolous insects hatch out of the egg as pretty much miniature versions of the adults, and change little as they grow up. The next stage, hemimetabolous development, is found in insects such as dragonflies, grasshoppers and Hemiptera (true bugs). Hemimetabolous insects have distinct nymphal and adult stages, but they don't have a pupal stage between nymph and adult. Wings, in those species that have them, grow folded up in wing buds and are not extended until the final adult instar. It should be noted that there is not necessarily a clear dividing line between ametabolous and hemimetabolous development - in some hemimetabolous insects, such as grasshoppers, there may be relatively little morphological distinction between nymphs and adults except for some features such as wings. In others, such as some Hemiptera, the distinction between nymph and adult may be quite notable. Holometabolous development, on the other hand, is an entirely distinct prospect. Holometabolous insects include moths and butterflies, flies, and beetles. In these taxa there is a distinct larval and adult phase. 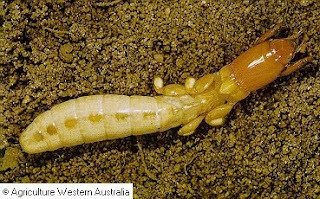 The larvae are soft-bodied and often vermiform (wormlike), and look completely different to the adults. 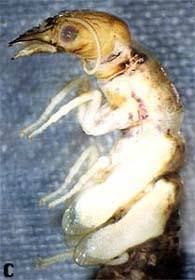 While nymphs of hemimetabolous insects might develop wingbuds, holometabolous larvae possess not even a trace of visible wings. They may lack the appendages of the adult, and they may possess appendages of their own (such as the tendrils of some caterpillars) that are lost by the adult. Between the larval and adult stages is a non-feeding, usually immobile pupal stage, within which the insect undergoes a complete developmental overhaul before emerging as the adult. Though holometabolous insects comprise the significant majority of modern taxa, they all fall within a single derived clade, the Holometabola, that probably appeared about the beginning of the Permian (Grimaldi & Engel, 2005). Phylogenetic bracketing indicates that they were derived from hemimetabolous ancestors, but how? How did such a significant change occur? Larva of hoverflies (Syrphidae), commonly known as "rat-tailed maggots". 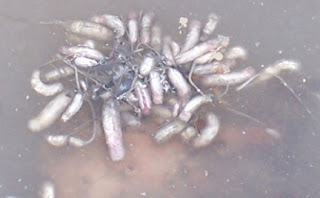 The "tail" is a breathing tube, allowing the maggots to survive in anoxic environments by extending the tube to somewhere where oxygen is available. Photo from here. One theory that was popular for some time was that the larval and pupal stages of holometabolans correspond to the nymphal stage of other insects. As I've already noted, many hemimetabolous insects also show significant differentiation between nymph and adult. There may be selective advantages to such differentiation, as the different stages may utilise different resources and not compete with each other. The holometabolous larva, it was suggested, was simply an exaggeration of this differentiation. However, the details of holometabolan metamorphosis refute this idea. In hemimetabolous nymphs, the cuticle is divided into sclerotised plates as in the adults. Holometabolan larvae in contrast, have a soft cuticle that is not divided into plates, and is ultrastructurally distinct from nymphal cuticle. During the pupal stage, collections of cells within the developing insect called imaginal discs proliferate and spread through the body, giving rise to adult organ systems such as eyes and wings, as well as the distinct adult cuticle divided into plates. Hemimetabolous nymphs have a fully developed nervous system much like that of their adults. In holometabolan larvae, the development of the nervous is halted at a rudimentary stage, and is not carried to completion until pupation. Even organ systems present in some form in the larva, such as the legs, may be partially or completely replaced by the products of imaginal discs during pupation, with little or nothing remaining of the larval tissue at maturity. Recently, Truman & Riddiford (1999, 2002) have revitalised an earlier theory that holometabolan larvae actually correspond to the pronymph of hemimetabolous insects*. The pronymph is essentially the final stage of embryonic development. Pronymphs have an underdeveloped nervous system like holometabolan larvae, and an soft undivided cuticle with a similar ultrastructure to that of a larva. In some hemimetabolous insects, the pronymph molts through to the first nymphal instar prior to hatching from the egg. In others, the insect hatches while still in the pronymph stage. The pronymph does not feed in these taxa, but lives off its yolk reserves before moulting to a nymph within a few hours or few days. It may be motile - dragnoflies, for instance, are able to move from land to water as pronymphs. Pronymphs and holometabolan larvae also show high levels of JH, juvenile hormone. The role of JH in insects seems to be to retard development, so if an insect moults in the presence of high levels of JH the resulting instar will be much like the previous (Erezyilmaz, 2006). In hemimetabolous insects, levels of JH decline before the pronymph moults, allowing development of the nymph, but in holometabolous insects JH levels remain high until the final larval instar. *The larva-as-pronymph theory is generally attributed to Berlese in 1913, but the idea that the larva was a sort of free-living embryo (a "crawling egg") was suggested by William Harvey in 1651, and its origins go all the way back to the writings of Aristotle in 322 BC (Erezyilmaz, 2006). The figure above, from Truman & Riddiford (1999), shows suggested stages in the evolution of the holometabolan larva from the pronymph. Stages (a) and (b), as already noted, are both found in living hemimetabolous insects. The major step, which remains undocumented, would have been the evolution of the ability to feed in the pronymph, allowing maintenance of the pronymphal stage through more than one instar - stage (c) in the figure. Lengthening of the pronymphal stage seems to have been matched by a shortening of the nymphal stage, though again, the exact mechanics of this are as yet undocumented. It is possible that once the pronymphal stage became the main feeding and growing stage, then the multiple nymphal instars became fairly redundant, in which case there may have been a selective pressure for their rapid loss. Eventually, we reach stage (d) - a single nymphal instar. This may be represented in the modern fauna by the Raphidioptera (snakeflies) and Megaloptera (dobsonflies). In these orders, the pupal stage remains mobile with well-developed legs (Grimaldi & Engel, 2005), as shown in the photo above of the pupa of Nigronia fasciatus (Megaloptera) (photo by Atilano Contreras-Ramos). The loss of mobility then leads to the fully-developed pupal stage. In some holometabolan insects, the imaginal discs don't develop until the end of the larval stage - (e) in the figure above - but in others - stage (f) - they develop early on and then remain quiescent until pupation. Examples are also known where development of adult tissues has been reactivated during the larval stage, such as the larviform reproductives of the beetle Micromalthus, perhaps by the development of localised resistance to the effects of JH. If we were able to understand how the holometabolan larva evolved, it could have further interesting implications for our understanding of evolution. Morphological change in evolution is generally assumed to happen gradually, but researchers have suggested at least some situations where it could theoretically happen much more rapidly (I briefly described one such situation here. Such saltatory suggestions have been derided as "hopeful monster" scenarios, and are currently regarded with some skepticism. One of the main issues with the "hopeful monster" is that these deviant individuals would need to reproduce in order to successfully found a new lineage, and it might be difficult to find a willing mate if you look too unusual. However, when the holometabolous larva first evolved, it may have still developed into an adult that looked little different from its hemimetabolous ancestors. What would the implications of this be for the establishment of the new developmental pathway? Could the larval stage have spread through the population unhindered by questions of reproductive liabilities? Is this one situation where the hopeful monster might just have had a little more hope? Erezyilmaz, D. F. 2006. Imperfect eggs and oviform nymphs: a history of ideas about the origins of insect metamorphosis. Integrative and Comparative Biology 46 (6): 795-807. Truman, J. W., & L. M. Riddiford. 1999. The origins of insect metamorphosis. Nature 401: 447-452. Truman, J. W., & L. M. Riddiford. 2002. Endocrine insights into the evolution of metamorphosis in insects. Annual Review in Entomology 47: 467-500. I have been working with Drosophila (Sophophora?) melanogaster for years now, but I was completely unaware of the literature on evolution of holometabolous insects. Thank you for bringing that lovely story to my attention. Which brings me to the next point. The developmental biology of Drosophila is extremely well known. I wonder if anyone in that field is working on this topic? They should be. I believe workers on Drosophila certainly have been working on this, and the development of Drosophila certainly is very well-known. But in some ways, that's almost a problem in itself - Drosophila is a horribly derived little creature, and making inferences about holometabolous (or worse, insect) development in general from Drosophila alone can be misleading That's another topic I've been considering - often the very features that make things like Drosophila, Caenorhabditis and Arabidopsis such wonderful subjects as lab animals are exactly the features that make them difficult as model organisms. "the very features that make things like Drosophila, Caenorhabditis and Arabidopsis such wonderful subjects as lab animals are exactly the features that make them difficult as model organisms"
As for the rapid evolution, looking how much depends on one-two factors sometimes, it's easy to believe. Good use of "saltatory" in a sentence. Thank you for going deeper into larva and nymph development. I wonder, is the transition from sponge and coral larval to adult sessile forms also controlled by JH? I'm imagining that if there is another mechanism, we might be able to stimulate transition to a latent (and probably genetically atrophied, but who knows?) sessile form for derived classes, in the same way that adult forms of (otherwise unknown) parasites have been educed by abusing their larvae. Wouldn't the first holometabolous adults have needed only to smell right, however they looked? When I think of hopeful monster scenarios, acromegaly comes to mind. Imagine changing conditions so that only successful wrestlers could reproduce. We might see a population of André the Giant in a few generations, that would look like, and shortly be, a different species. André, note, succeeded in reproducing. Just to say very glad I found your blog by way of RockPaperLizard. Its fascinating. I write and draw in a very unscientific way about all kinds of natural things new to me here,and their history too so I so delighted to see the old natural history illustrations etc.I will definiteley keep dropping by.. Val from Pencilandleaf. "Hemimetabolous insects... Wings, in those species that have them, grow folded up in wing buds and are not extended until the final adult instar." The outer cuticle layer of the wing buds would be shed, but not the interior tissue. Homology has been suggested between insect gills (such as the wing-like gills of mayfly nymphs) and wings - the idea was very popular for a while. Unfortunately, the evidence one way or another is still all rather circumstantial. When we think about the transition from an ametabolous to a holometabolous life cycle, can we really avoid the "hopeful monster" step? 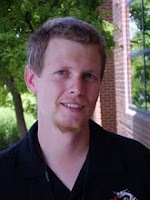 And what do you think about Donald Williamson's hybridization-gone-wild concept for the evolution of larval forms? I have heard that all the respectable people think it's completely nuts. However, my background in biology (and specifically in genetic engineering) is not good enough to know whether the idea is completely impossible or just wildly unlikely. If it's just wildly unlikely, I'm not sure that's any worse than the hopeful monster. Maybe we could call it the "hopeful hybrid." 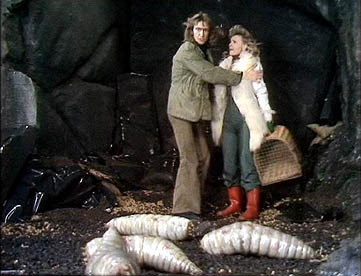 I don't think that a hopeful monster is necessary for the evolution of the larval stage, though I wanted to point out that this is one situation where the monster's case is not instantly hopeless. There's also a matter of definition to consider: note how the proposed replacement of the nymphal stage with an extended pronymphal stage doesn't immediately require a major morphological change in each stage, only a change in their relative timing. As for Williamson's hybrid origin scenario: let me make no bones, it is completely ludicrous. The actual hybridisation event is only the smallest problem with it; far more serious is that it requires the sudden appearance ex nihilo of developmental pathways that were seemingly not present in either parent. A hybrid between a donkey and a horse is a mule, not an animal that starts life as a donkey before transforming into a horse. I agree on Williamson's difficulty with development. But how can an abbreviation process lead to the life cycle of Luidia sarsi? Who said that it did? But I don't really see the relevance. The larva of Luidia sarsi is not fundamentally different from that of other asteroids, in most of which the larva metamorphoses into the adult in its entirety. Despite the continued viability of the Luidia larval form after the separation of the juvenile, it does not ultimately develop any further, and cannot be considered generationally separate. It should also be noted that Luidia is not a particularly basal form among starfish, and there is no reason to assume its development particularly plesiomorphic. Your terminology (plesiomorphic, basal form) is losing me: I don't have the background to interpret what you are saying by just resorting to Google. My point is that the transition from the medusa to the starfish is so bizarre that it's difficult to imagine any gradual ontogeny that starts with one and ends with the other. In other words, how can one imagine such a critter coming into existence without some kind of hopeful-monster step? Ah, my apologies for misunderstanding. 'Plesiomorphy', offhand, means the ancestral morphology, so when I say that there's no reason to assume Luidia is more plesiomorphic than any other starfish, I mean that there's no reason to assume that it bears a closer resemblance to the ancestor of all starfish. 'Basal', in this context, means that its evolutionary history separated early from that of other members of the group being considered. The starfish question is a bit different from the insect one because, in their case, the larval development is ancestral, with similar larvae being found not only in other echinoderms (sea urchins, sea cucumbers, etc.) but also in hemichordates, which are the closest living relatives of echinoderms. Some have thought, in fact, that this kind of development might be ancestral for all animals, but that's a bit more of an open question. If it was, then it probably derived from a small ancestor that was more 'larva-like' than 'adult-like' (if you look at basal animals such as Trichoplax). The adult form may have evolved through something as simple as larger size, as large adults became ecologically distinct from still-small juveniles. Differential selective pressures on juveniles and adults would have lead to their becoming distinct in form, leading to the larva-adult separation. Again, though, there's no reason to assume the change in either must have been catastrophic. In my view, the larvae is equivalent to a placenta with the pre-adult living within it (rather than next to it). At metamorphosis, the larvae is just a container with gradually deteriorating equipment.